Can The St. Louis Blues Go From Worst To First In Central Division? The St. Louis Blues have four games to go in the 2018/19 NHL season and there’s a chance they could go from worst to first in the Central Division when the campaign ends on April 6th. In fact, they may go from worst in the entire league to division champions. As of March 31st they were sitting in third place in their division with 92 points, trailing the Winnipeg Jets and Nashville Predators by just two points each with a game in hand on Nashville. The Blues finish the year with a tilt vs the Colorado Avalanche followed by a trip to the Windy City to take on the Chicago Blackhawks and then return home to host the Philadelphia Flyers and Vancouver Canucks in their final two outings. Nashville is scheduled to meet the Sabres in Buffalo and then take on Vancouver and Chicago at home in Music City in to wrap up the season. As for Winnipeg, they will be clashing with Chicago, the Minnesota Wild, Colorado Avalanche and Arizona Coyotes all on the road. The schedule certainly favors Nashville and St. Louis since three of the Blues’ opponents are out of the playoffs and all three of Nashville’s won’t make the postseason. Not only are the Jets on the road for the last four games, but they’re facing three teams which are still in the playoff race and desperate for points. Also, when checking out the current form of the Blues, Predators and Jets we see Winnipeg is 5-5 in their past 10 outings with three straight losses. Nashville is 5-4-1 with a loss and the Blues are 6-3-1 with a win. Although the Blue’s campaign has been a bit of a roller coaster they have at least guaranteed themselves a playoff spot for the seventh time in the past eight years after missing the mark last season. However, they weren’t too happy with the way it came about since they were doubled 4-2 on the road by the New York Rangers on March 29th and clinched the spot when the Colorado Avalanche edged the Arizona Coyotes by a score of 3-2 the same night. 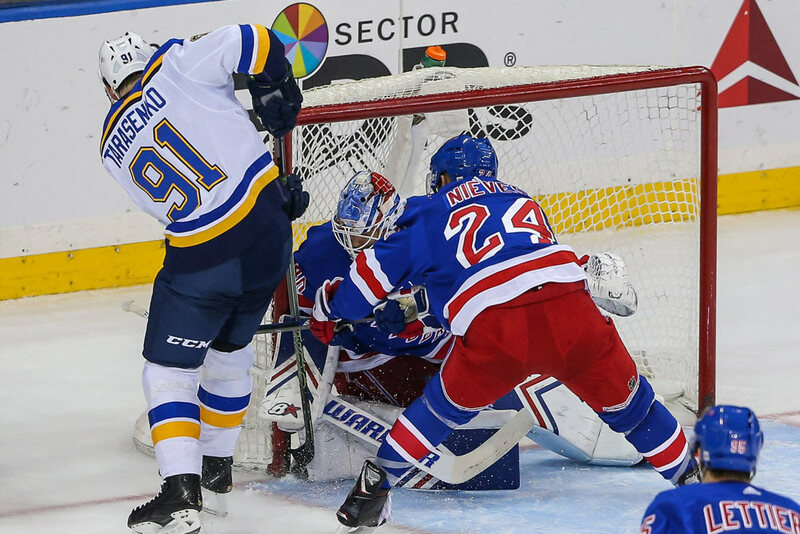 The Blues then bounced back with a 3-2 overtime win at home against the New Jersey Devils the next day. 15-18-4 for 34 points. After 78 games they owned a mark of 42-28-8, meaning they have gone 27-10-4 over the past 42 contests. Just seven teams have managed to make the playoffs after sitting in the basement of the league on or after Jan. 1st since the 1967/68 season, which is when the Blues entered the NHL. Other clubs to manage the feat were the Minnesota North Stars, Edmonton Oilers, Los Angeles Kings, Ottawa Senators and Toronto Maple Leafs twice. The Blues took a bit of a gamble back in mid-November when Craig Berube was hired to take over the head coaching duties from Mike Yeo. The team was 7-9-3 at the time and has gone 35-19-5 under Berube. The new coach helped improve the squad’s defense and penalty killing as they’re nor ranked sixth and eighth respectively in the League. Binnington has gone 21-5-1 since being called up with a goals-against average of 1.85, a save percentage of 92.8 and five shutouts. The Blues went on a franchise-record 11-game winning streak from late January to mid-February with Binnington winning nine of the games and Jake Allen the other two. Binnington also posted four shutouts in those nine victories and it was no surprise he was named February’s rookie of the month. There’s no question Berube and Binnington were catalysts in the blues’ turnaround, but we can’t forget the contributions of forwards Ryan O’Reilly and Vladimir Tarasenko. O’Reilly came over in a trade with Buffalo last summer and leads the team in assists with 46 and points with 73. he’s also racked up 20 power-play points, a shorthanded goal and five game-winners. On top of that, the center is one of the best faceoff men in the league and is a plus-23. As for Tarasenko, the Russian forward leads the team with 30 goals and has added 31 assists. He had a slow start to the season, but posted a 12-game scoring streak after the new year in which he contributed 11 goals and 11 helpers. He also leads the team with 11 power-play markers and has 19 points with the man advantage. It’s the fifth straight 30-goal season for the 27-year-old winger. Other players who have improved as the season progressed are Brayden Schenn (49 points), David Perron (42 points), Tyler Bozak (36 points) and blue liner Alex Pietrangelo (36 points). O’Reilly (27 goals), Tarasenko (30) and Perron (21) are the only 20-goal scorers on the team, but there are eight others who have reached double digits. The Blues have a well-balanced team which caught fire at the right time and still hasn’t really cooled down. They are the only remaining franchise from the 1967/68 NHL expansion that hasn’t won a Stanley Cup. To put things in perspective, their drought is basically as long as the Toronto Maple Leafs’ who last hoisted the silverware in the spring of 1967. On paper at least, it looks like the Blues have a great shot at edging out Nashville and Winnipeg for the Central Division crown this year to gain home ice advantage early in the playoffs. When the postseason does get underway the Blues should enter them as one of the hottest teams in the league since January and definitely shouldn’t be taken lightly.